I am out numbered in the house 3:1 and I have learned to pick my battles. I chuckled and said, “No. You should have passed a tissue to Spencer and dh they were crushed. This kid is much older than his nine years under his belt. Then of course dh has to say, “We are only thinking of you,” and batting his eyelashes the whole time. Nate, well, Nate was just standing there watching it all unfold. I gave up, they won, in the cart went one three pack of the Organic Batter Blaster. The mix does not come out very forcefully like a can of whipped cream. To be honest, I thought it would come out with a bit more force than it did. I made sure to give it a really good shake before using it, removed the lid and it was show time! It was easy to come out of the can. I made only the normal round pancake. I thought of spelling out names or other shapes but I figured I should stick to the tried and true. Dh and Spencer were the first two to try the pancakes. 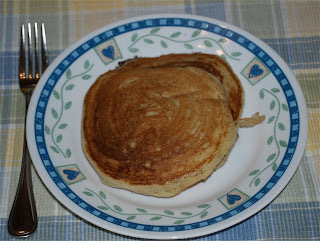 Then Nate tried them, he is not a pancake fan of any sort. (Where did I go wrong with this child? lol…) and he really liked them. He went back for seconds which is not something he does very often. I thought the pancakes were good and yes, it was nice not to have oodles to clean up afterwards. 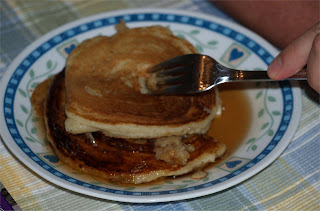 It was a nice change of pace and I could see them being used on camping trips or simply to have on hand to make some quick pancakes up. Would I use it all the time? I don’t think so because I really like making my batter from scratch. They are good and fun though!